Over the past couple months I’ve worked out the kinks on a new .22 target pistol, and I figured I’d share the details. My new .22 target pistol: Marvel Precision Unit 1, Springfield Armory Range Officer 1911 frame, and an UltraDot red dot scope. After much consideration, I decided to go with a Marvel Precision Unit 1. That is a conversion unit that you use to turn a 1911 into a .22 pistol by replacing the slide and using different magazines. The Marvel has a good reputation, it is known to function reliably, and is getting to be famous for its accuracy. Mine came with a 5-shot test target fired at 50 yards. The test group measured 0.81 inches. That really is excellent, considering that to my eye the X-ring on the 50 yard slow fire target looks to be 1 & 11/16 inches. Bottom line: it’ll hold a group tighter than I need it to hold. 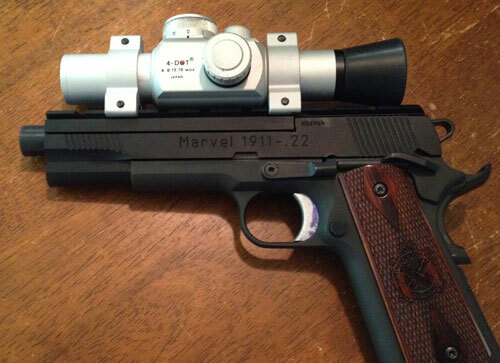 I ordered the Marvel unit with an extra magazine, the iron sights, and a scope mount rib. Altogether, including shipping, I paid about $600. Speaking of shipping, it took a long time for them to get me the unit. I placed the order online on April 5, 2012 and it shipped to me on June 12, 2012. I was definitely not thrilled with waiting that long, but I understand they’re busy. So, between then and now, here is what I ended up doing. I shot the gun first with the iron sights. They are good target sights, and I shot fine. However, I’ve been curious about shooting a red dot, so I picked up an UltraDot and put that on top. My 25 yard Timed and Rapid Fire scores didn’t change, but my 50 yard Slow Fire scores seem to have improved. I’ll stick with the dot a little longer and see how it goes (although I’ll continue to shoot iron sights on my .45). For the lower I’m using a Springfield Armory Range Officer 1911 .45 ACP that I purchased very late in June. Since then I’ve put in a short match trigger from Cylinder and Slide (required some hand-fitting), a reduced-power hammer spring (24 pound ILS spring from Wolff), and tuned the sear spring. The hammer and sear already looked really good. The stock trigger on the Range Officer was not great. It started at around 5.5 lbs, and had a little bit of creep in it. The break was crisp, which I like. After fitting a new trigger that has a better length for my hand and carefully filing the trigger and a little bit of the trigger channel, the trigger movement is now quite smooth, and down to a nice 2 lbs. I also set the over-travel stop so the trigger won’t move any more than it must. At Camp Perry during the second week of July I asked at the Marvel table for any tips on reliability and the response was that it should all work fine, but a lighter hammer spring may help if there are issues with loading new cartridges. I did in fact have a few of those issues, and so I put in a lower-powered ILS hammer spring. I fired 80 rounds this afternoon after replacing the spring, and had not a single problem. So, what’s left? Well, I have a pair of Nill grips on my Clark Heavy Slide 1911, and I like the feel. I may get a pair for this gun too. Also, I need to pick up another 1911 sear spring so I can tune it to 3.5 lbs for when I put the Range Officer slide back on the gun for shooting .45 ACP. Two pounds is too light for a gun with that kind of recoil, in my opinion. All-in-all, I’m quite pleased with this set up, and I’m looking forward to competing with it. I’ve been competing in Bullseye Pistol matches since 1990, and have used the same Ruger Mk II pistol for that entire time. Over half a dozen national pistol matches and many local, state, and regional competitions, not to mention countless hours of practice, I estimate that I’ve put a quarter of a million rounds through the gun. The Ruger still functions, but after 22 years of heavy use, it’s pretty worn out. I’ve had to replace numerous parts over the years, including two firing pins, a firing pin stop pin, and the recoil spring. The gun is loose, and it feels loose. Could it be tightened? Maybe. Regardless, it’s time for a new gun, and I’ll keep this Ruger as a back up. The gun has been re-blued, and it is high time for another re-blueing. It is down to bare metal where my fingers and the heel of my hand grip the gun. Props to the old Ruger though, it will still shoot clean targets (clean means 100 out of 100 points). I’m impressed that it still maintains that precision.